Ying Zheng, who ascended to the throne of state of Qin at age 13, renamed himself as Qin Shin Huangdi. In his rule, he brought surrounding areas under his control and rewarded soldiers for each enemy head that they took. He used to bury dissenters alive. He standardized currency, weights & measures and built an extensive network of roads. 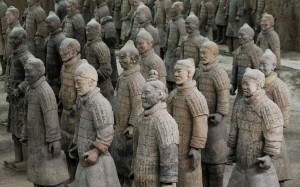 His best claim to fame is the army he created himself after his death which came to be known as Terracotta warriors. Terracotta warriors had only one aim, which is to protect their emperor even after his death. China’s first emperor, Qin Shi Huangdi, was extremely concerned about his assassination during his reign. His concern was to such a high level that he rarely stayed in the same palace for two nights in a row. In order to safeguard his afterlife, he built an army of life-size warriors made out of clay and got them buried around his tomb. 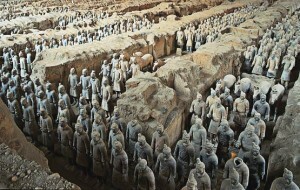 Around 7000 Terracotta sculptures were buried which were facing eastwards to a pass in the mountains from where the enemies were expected to attack. The burial was undisturbed until 1974 when a group of farmers found them while digging a well in Shaanxi province. Till date, around 1000 sculptures have been restored. Now, it is a famous tourist attraction in China. 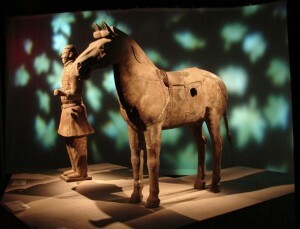 ‘Terra Cotta Warriors: Guardians of China’s First Emperor’ is a 12000 ft. exhibit that runs through March 31, 2010. It features 15 Terracotta sculptures – two infantrymen, one chariot driver, two officers, one armored warrior, two archers and a cavalryman, two musicians, one strongman, one court official, one stable attendant and a horse. Also on display are weapons, armor made from limestone, coins, ornaments and roof tiles. 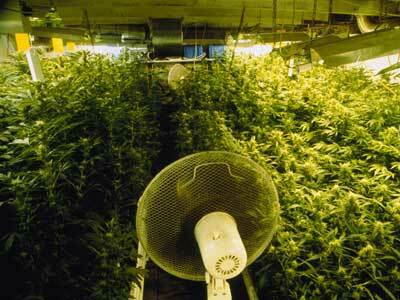 The figures are almost 6-feet tall and weight 300-400 pounds each. They were made in an assembly-line process in which legs and feet were made from solid clay and torsos were built from coils. Other body parts such as limbs, head, ears and hands were fixed separately. Intricate facial expressions, different hairstyles and expressions were given to all of them. Presently, no pigments remain and weapons once held by warriors are either rotten through the time or stolen during different uprisings.